The Casual Vacancy, JK Rowling’s tale of darkness and dysfunction in a seemingly idyllic West Country village has been adapted into a BBC One drama series. It was produced by Neil Blair through his own independent production Company andJK Rowling herself was closely involved with the production. The first episode of which airs 9:00pm Sunday 15 February 2014. 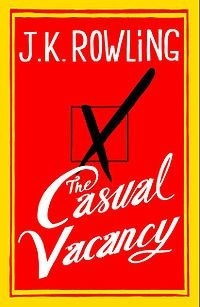 The Casual Vacancy has been described as a blackly comic, thought-provoking and constantly surprising’ comic tale. The protagonist is a young woman with Obsessive Compulsive Disorder who lives in a run down council estate called ”The Fields” whose character was inspired and shaped by J.K Rowling’s own teenage battle with Obsessive Compulsive Disorder, anxiety and depression. It takes place around a peaceful small town called Pagford Which at first appears to be an English idyll, full of the hanging baskets, the war memorial, the scrubbed cottages, cobbled market square and an ancient abbey. However behind its tourist-friendly façade all is not as rosy as it seems and the mysterious death of a Parish Councillor named Barry Fairbrother a man of “boundless generosity of spirit” leaves a space on the parish council. This becomes the catalyst for confrontation as the forces of darkness, led by scheming Howard Mollison, the obese delicatessen owner, seize their chance to get on the Parish Council and reassign “The Fields” to the district council of the nearby city, Yarvil, thereby off-loading responsibility for its drug-addled inhabitants, and driving them out of the catchment area for Pagford’s nice primary school. However the residents of Yarvil don’t want anything to do with The Fields, and it Soon becomes a hot-bed of seething antagonism, passion, duplicity, rampant snobbery, sexual frustration, ill-disguised racism, Rich at war with poor, teenagers at war with their parents, wives at war with their husbands, teachers at war with their pupils. French automotive executive Louis Renault was born 15 February 1877. In 1899 he became one of the founders of French multinational vehicle manufacturer Renault S.A and was a pioneer of the automobile industry producing a range of cars and vans, as well as, trucks, tractors, tanks, buses/coaches and autorail vehicles.Renault built one of France’s largest automobile manufacturing concerns, which bears his name to this day. During World War I his factories contributed massively to the war effort notably so by the creation and manufacture of the first effective tank: the Renault FT tank. Accused of collaborating with the Germans during World War II, he died while awaiting trial in liberated France in October 24, 1944 under uncertain circumstances. His company was seized and nationalized by the provisional government of France although he was never tried or convicted. His factories were the only ones permanently expropriated by the French government In 1956, Time Magazine described Renault as “rich, powerful and famous, cantankerous, brilliant, often brutal, the little Napoleon of an automaking empire”; “vulgar, loud, domineering, impatient, he was a terror to associates, a friend to practically none,” adding that to the French working man, Renault became known as “the ogre of Billancourt.Headquartered in Boulogne-Billancourt, Renault owns the Romanian manufacturer Automobile Dacia and the Korean Renault Samsung Motors. Renault also owns subsidiaries RCI Banque (providing automotive financing), Renault Retail Group (automotive distribution) and Motrio (automotive parts). Renault Trucks, previously Renault Vehicules Industriels, has been part of Volvo Trucks since 2001. Renault Agriculture became 100% owned by German agricultural equipment manufacturer CLAAS in 2008. Carlos Ghosn is the current chairman and CEO and the French government owns a 15 percent share of Renault. As part of the Renault-Nissan Alliance, the company has become the fourth-largest automotive group. Together Renault and Nissan are undertaking significant electric car development, investing 4 billion euros ($5.16 billion) in eight electric vehicles over the next 3–4 years.The company’s most successful cars to date are the Renault Clio and the Renault Mégane, and its core market is Europe. The company is known for its role in motor sport, and its success over the years in rallying and Formula 1. Former English race car driver and Formula One Champion Graham Hill OBE was born 15th February 1929. He was twiceFormula One World Champion. He is the only driver to win the Triple Crown of Motorsport — the 24 Hours of Le Mans, Indianapolis 500 and Formula One World Championship. Graham Hill and his son Damon are the only father and son pair both to have won the Formula One World Championship. Tragically Graham Hill sadly was killed on 29 November 1975 when the aeroplane he was piloting crashed in foggy conditions near Arkley golf course in North London. Hill and five members of his racing team were returning from car testing at Circuit Paul Ricard in France and due to land at Elstree Airfield. All six were killed. Although Graham’s legacy lives on, and both his son Damon and grandson Josh, are racing drivers. Tomi Petteri Putaansuu A.K.A Mr Lordi The lead singer of Finnish Heavy Metal band Lordi was born on 15 February 1974. Lordi were formed in 1996 by the band’s lead singer, songwriter and costume-designer, Mr. Lordi. The band is known for wearing monster masks and using pyrotechnics during concerts. They rose to domestic success with their 2002 single, “Would You Love a Monsterman?”. Lordi made history in 2006 by winning the Eurovision Song Contest with a record 292 points, becoming the first Finnish performer to win the contest. Lordi were also featured on the 2006 MTV Europe Music Awards in Copenhagen when the band’s frontman, Mr. Lordi, presented the award for rock. They were also the closing act, playing their single “Hard Rock Hallelujah”. They also performed on Britain’s Making Your Mind Up for the Eurovision Song Contest. Lordi performed on the main stage at Ozzfest 2007 and toured with Type O Negative and Twin Method until Halloween night 2007. Lordi released their fourth album Deadache in 2008. produced by Nino Laurenne. The release spurred yet another change in the band’s costumes. The album was similar in style to its predecessors, melodic hard rock and heavy metal, though with more horror theme. Mr Lordi spent time in Los Angeles with Jeremy Rubolino and former Kiss guitarist Bruce Kulick writing two new tracks, “Cut Off My Head” and “Call Off The Wedding”. In March 2010 Mark Slaughter and Bruce Kulick played in a part of their new song. Babez for Breakfast was recorded in Nashville, and produced by legendary Michael Wagener, featuring the single “This is Heavy Metal”. On 4 October 2010 it was announced that drummer Kita had left the band, and was replaced by Otus. In 2011 Mr Lordi took part in Finnish TV-series “Kuorosota” and they were unable to tour however they played a few metal festivals. Sadly in February 2012 Otus tragically died. Due to the death of Otus, Lordi cancelled all their concerts scheduled for the beginning of 2012, but they had some summer festival concerts that they couldn’t cancel. Lordi got help from Jimmy Hammer, the drummer of Finnish band Ironcross, who played drums for Lordi’s 2012 concerts. Jimmy Hammer used a monster disguise to fit in the band, and was only called as “the drummer”. In September 2012, Scarchives Vol. 1, a compilation CD+DVD, was released to celebrate Lordi’s 20th anniversary. The CD contains previously unreleased old Lordi songs, including all the songs from the unreleased album from 1997, Bend Over And Pray The Lord. The DVD contains Lordi’s very first concert in Helsinki 2002. The video was edited by Otus. Keyboardist Awa left the band in fall of 2012, her final Performance was at the 20th anniversary concert, at Simerock in Rovaniemi, Finland on August 11. Lordi’s sixth studio album To Beast or Not to Beast was recorded 2013 and included two new members, Mana as the new drummer and Hella as the new keyboardist and The first single from the new album, “The Riff”, was released digitally on February 8, 2013. After the release of the single the band took part in Wok WM competition in Germany. The album was released on March 1, 2013. A European tour in support of the new album, “Tour Beast Or Not Tour Beast”, started in April, 2013. The tour also included one concert in Japan. On June 28 2013 in Savonlinna, Finland Mr Lordi opened first official Lordi-exhibition, The Other side of Lordi. Which included Lordi’s former costumes and stage props, including Lordi’s album cover artworks (painted by Mr Lordi). Mr Lordi and Amen visited the exhibition during the opening night. Lordi’s seventh studio album “Scare Force One”was released on October in Europe, and November 2014 in North America. The first single from the album, “Nailed by the Hammer of Frankenstein”, was released digitally on September 19th 2014 and On November 1st, Lordi along with Finnish Folk Metal band Korpiklaani, performed at The Circus in Helsinki. Ronnie Vannucci Jnr the drummer and percussionist with Las Vegas band The Killers was born15 February 1976. The killers were formed in 2001, by Brandon Flowers (lead vocals, keyboards) and Dave Keuning (guitar, backing vocals). Mark Stoermer (bass, backing vocals) and Ronnie Vannucci Jr. (drums, percussion) completed the current line-up of the band in 2002. The name The Killers is derived from a logo on the bass drum of a fictitious band portrayed in the music video for the New Order song “Crystal”. studio albums which the band have released include Hot Fuss (2004), Sam’s Town (2006) and Day & Age (2008)and Battle Born and Direct Hits. They have also released one compilation album, Sawdust (2007) and one live album and DVD titled Live from the Royal Albert Hall (2009). John Helliwell, the English musician with the British Rock Band Supertramp, who was born 15th February 1945.Supertramp formed in 1969 under the name ”Daddy” before renaming themselves in early 1970. Though their music was initially categorised as progressive rock, they have since incorporated a combination of traditional Rock, pop and art rock into their music. The band’s work is marked by the inventive songwriting of Rick Davies and Roger Hodgson, the distinctive voice of Hodgson, and the prominent use of Wurlitzer electric piano and saxophone in their songs. Ali Campbell, lead singer and one of the founding members of British Reggae/pop band UB40 was born 15 February 1959. Formed in 1978 in Birmingham, England, UB40 were named after the Unemployment Benefit form, in protest of widespread unemployment (As was the song “One in ten”. UB40 were influenced by the many blues parties they attended as teenagers in the multicultural Balsall Heath area of Birmingham. Their love of ska, reggae and early lovers rock inspired such original tracks as “King”, “Madam Medusa”, “Food for Thought”, “Signing Off” and “One in Ten”. Their early musical style was unique, with a heavy influence of analogue synthesisers, psychedelic rock guitar, saxophone and dub producer techniques. The Campbell brothers are the sons of the late folk musician, Ian Campbell, who regularly took them to folk festivals and gigs and introduced them to music and to touring. It was at one of his father’s appearances in a pub that Ali Campbell made his singing debut, with Dave Swarbrick’s daughter, Suss, singing “Why Does It have To Be Me?”. The ethnic makeup of the band’s original lineup is diverse, with musicians of English, Scottish, Irish, Yemeni and Jamaican parentage. The band’s initial lineup lasted for 30 years from the band’s formation in 1978 until 2008 when frontman Ali Campbell departed. Since that time, two other founding members (Mickey Virtue and Astro) have also left the band, and the trio of Campbell, Virtue, and Astro have since formed UB40 Reunited and played Birmingham O2 Academy on 19 December, London IndigO2 on 20 December and Manchester Academy on 21 December 2014. In 2010 UB40 toured American and performed a nationwide UK tour of theatres in October/November 2010 performing their seminal album Signing Off, in full, along with a second set of popular UB40 songs. To coincide, on 1 November 2010 a remastered 2CD+DVD of Signing Off was released as a ’30th Anniversary Special Edition’. The next album Getting over the Storm was released in 2013 and was subsequently awarded BBC Radio 2’s ‘Album Of The Week’ accolade and received 5-star reviews from the UK’s music press on its release in September 2013. Sadly though Astro left the band in November 2013, describing it as a “rudderless ship” and criticising the “serious lack of communication between the band and management” and the country-orientated direction of their latest album. He later joined former UB40 members Ali Campbell and Mickey Virtue on stage at the indigO2 Arena in London on 6 December 2013, and also toured summer 2014, and appeared at the Brentwood Festival. The latest album Silhouette, featuring the trio was released in 2014. Despite their success UB40 have had a spot of legal and financial trouble- In 2011 five founder members of the group and directors of their DEP International label, had bankruptcy proceedings started against them and they were declared bankrupt. And In September 2014 the band served writs against Ali Campbell, Virtue, and Astro, claiming that were illegally using the UB40 name. During their three-decade long career UB40 have placed more than 50 singles in the UK Singles Chart, and also achieving considerable international success. The band have also been nominated for the Grammy Award for Best Reggae Album four times, and in 1984, were nominated for the Brit Award for Best British Group. One of the world’s best-selling music artists, UB40 have sold over 70 million records. Among Their hit singles are their debut “Food for Thought” and two U.S. Billboard Hot 100 number ones with “Red Red Wine”, “Can’t Help Falling in Love” and “I Got You Babe” featuring guest vocals from Chrissie Hynde of the Pretenders, and have become one of the most commercially successful reggae acts of all time in terms of record sales (over 70 million), chart positions and touring schedule. They have performed twice at the Night of the Proms, in 2000 and in 2006. In 2006 UB40 were nominated for a Grammy Award (Reggae category) for their album Who You Fighting For. All three of their UK number one hits and four of their five U.S. top ten hits were cover versions. UB40 collaborators include: Pato Banton, Madness, Bitty McLean, Chrissie Hynde, Maxi Priest, Robert Palmer, Hunterz, Japanese artist Mikidozan, French artist Nuttea, Lady Saw, Afrika Bambaataa, 808 State.